The British Virgin Islands have been on your mind a lot recently. You were there just a few months ago. Then Hurricane Maria arrived. The Category 5 storm—one of the most intense hurricanes the Atlantic Ocean has ever seen—left Puerto Rico, Dominica, Guadeloupe, and so many other islands in ruins. The rebuilding process will be slow; airports are just starting to reopen. And much-needed money from tourism will be even slower to return. But that doesn’t mean you should stop dreaming about your next visit. During your last trip, you explored the Baths, sailed between beach bars, and found hidden snorkeling spots. From the main islands—Tortola, Virgin Gorda, Anegada, and Jost Van Dyke—you stared at more than 50 smaller islands in the distance. Most are uninhabited. Few receive visitors aside from passing sailboats. But they all must have a fascinating history. Great Thatch was one of the first islands to capture your imagination. 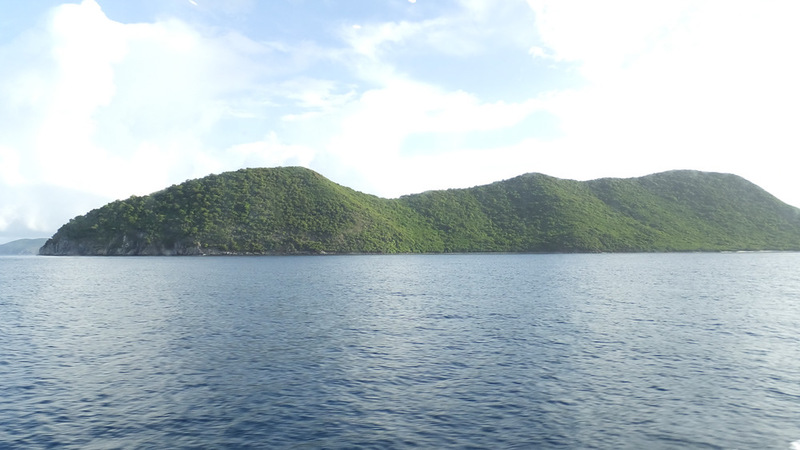 You can see one of the BVI’s westernmost islands from both Tortola and Jost Van Dyke. St. John, in the U.S. Virgin Islands, lies across the Narrows, a channel known for its strong currents. Due to its central location, the small island once had a customs house and a post office on it. Skiffs from Charlotte Amalie delivered mail that had arrived from larger ships overseas. Pirates probably looted imported goods. There was once a sugar plantation and a well-publicized incident involving a boat seizure, as well. Only ruins remain on the hilly island. Genip trees, drooping with green fruit, block the old paths. Stone buildings, including a cook house and an animal corral, are covered with dense vegetation. So is a deep cistern. Goats have ruled the island for at least 100 years. While most visitors, who snorkel off boats, never set foot on the island. At least that’s what you had pieced together about Great Thatch earlier this year. Like so many of the other islands, it’s surely changed. Now you look forward to eventually checking it out for yourself.